In the US, a child goes missing every 40 seconds. You never think it will happen to you. Until it does. Alone and scared, Karla Dyson is unwilling to leave the fate of her son’s life in someone else’s hands. When she catches a glimpse of the abductors speeding away, she decides to fight back. In a heart pounding race against time, Karla begins a high speed pursuit and will stop at nothing to save her son’s life. “Okay, God, I know I never pray to you unless somebody is sick. Or somebody’s dying or in an airplane. Do you remember “The Call” from a few years ago, with Halle Berry as a member of a 911 call center who was constantly talking to the victim of a kidnapping case. A victim who was locked up in the trunk of the kidnapper’s car. It was a story full of nonsense but it was terribly exciting and unnerving. Here it’s about something similar. Only now, Halle Berry is the one whose son is kidnapped by an unknown, after which she starts to chase the kidnappers with her car. Ultimately, this film is nothing more than one long car chase with Karla driving her burgundy red SUV. I can already tell you this. It’s also a thrilling movie. But unfortunately, it’s also full of nonsense and irritating developments. Yes, it’s exciting. But it’s even more annoying. “Kidnap” is not only about kidnapping innocent kids, but it’s also about the desperation and perseverance of a mother. 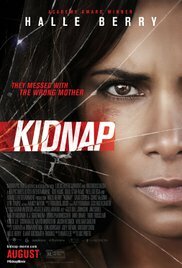 Halle Berry shows that she wants to rescue her son out of the hands of the kidnappers at any cost. But that’s also the only positive thing. The way she demonstrates that it’s better not to mess with a raging mother who protects her child frantically. Furthermore, it was simply a terribly annoying film. I already mentioned that it can be exciting sometimes, but unfortunately these exciting moments were ruined by totally nonsensical events. I’ve never looked at a screen so many times with disbelief and saying “Oh come on” to myself regularly. Even my wife tried to calm me down and prepared a soothing tea for me. I wouldn’t be so gentle. Admittedly, I guess the main characters just needed to follow the script. The subject is fairly straightforward and leaves little room for improvisation. Kidnapping a child is the central theme and that’s it. The course of the story therefore is already predetermined. That’s self-evident. But the denouement being so predictable, was a bit too much. But what really pissed me of, was the behavior of Halle Berry. I’m sorry, but if my son was in that car I was chasing, I wouldn’t be driving like a stressed out grandmother. And believe me. If I had the chance, those kidnappers would see tire marks on their foreheads even weeks later. And if someone from a police force drives past you, wouldn’t it be smart to ram the alleged car of the road? Sometimes it annoys me what people do in a movie. In “Kidnap“, it was the other way around. Here I was annoyed about what she didn’t do. I’m not blaming Halle Berry. I guess she was just following the script. Is “Kidnap” a movie you’d love to see? So, you want to see a not so very intelligent film which sometimes seems exciting? A film with virtually no interaction between the different characters? And the protagonist constantly performing monotonous monologues as she pursues the perpetrators. You don’t mind if the intervention of the police forces seems so indifferent while the motorway is being recreated into a junkyard? And finally, you don’t have kids yourself? Well, that means “Kidnap” is something for you. Fortunately I didn’t bother to watch it on the big screen. PS. One last warning. Are you a fan of action-packed, lightning-fast car chases? Well, forget about that here. It’s perhaps a mega-long chase, but this one is at snail’s pace. It looks like a road-rage-course for seniors.